see with our bodily eyes. In last week's Web Wandering Wednesday I posted a photograph I believed to be a postmortem image and said, "I Think She's Dead!" Your comments and skepticism were dead on (pun intended). I have spent the last week in the public library, on the computer, and on the phone with Iowa to resolve some of the major issues. Will we ever be certain of this young woman's status at the time she was photographed? I doubt that we will, but with the following research we can make some educated guesses. I have provided links to images that illustrate some of the points discussed. The links are all of postmortem photographs. Some of the photographs are disturbing to our twenty-first century sensibilities. If you are uncomfortable with postmortem photographs, please don't look. 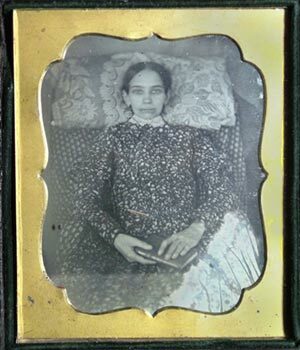 Postmortem photography, photographing a deceased person, was a common practice in the nineteenth and early twentieth centuries. Photography was expensive and most photographs were taken to commemorate a special occasion or event in a person's life. The largest group of nineteenth-century American genre photographs, however, were postmortem photographs. A fact I found surprising until I researched the justification for the statistic. Some estimates indicate that one-third of all photographs taken during this period of time were postmortem photographs. My research indicates this was because the deceased had not lived long enough to celebrate a special occasion, had been unable to afford a photograph, or had already lived a long life prior to the advent of photography. The postmortem photograph would have been the only photograph made of the person. It is evident from the comments to my post and my own experience with postmortem photographs that they are largely unseen and unknown. This can be attributed to the fact that as the response to death changed in America many of these photographs were destroyed by family members that found them gruesome. Sally Jacobs, The Practical Archivist, remarked on seeing all the baby and children postmortem photographs she cared to, as they were heartbreaking. The high incidence of photographs of dead children is in direct proportion to the high infant mortality rate that existed throughout the century. Many times I have found unnamed children in the census under the age of one year, their survival obviously uncertain. Also listed in the census are the number of children a woman gave birth to and how many of those children were living. Often a woman had given birth to six children, but only two were living. It was a perilous time for infants and children. A postmortem photograph was, in many cases, the only portrait made of a child or an adult and much pride and artistry went into them. Infant and child postmortem photographs are heartbreaking, but they were cherished by parents and family that had no other form of rememberance. I found the following example one of the most heartbreaking of all the photographs I have seen. The child had obviously been ill, note the medicine on the table. The father holds the child; the mother looks inconsolable. One of the very strangest postmortem photographs of a child I have ever seen can be found here. I can offer no explanation for the posed drama found in this photograph. I had never seen a postmortem photograph of an adult sitting in a chair; neither had most of you who commented. Early postmortem photographs had more variety than later ones which were funeral photographs. The body was often shown sitting or even standing in an attempt to make the appearance of the deceased more life-like. So the deceased sitting in a chair or even standing was not uncommon. This is a photograph in my collection that I have considered suspicious for several reasons. The stand, the position of the feet, the fact the right leg does not appear to be touching the floor, the unnatural look of the hands, and the vacant expression. Is it a standing postmortem? Stands were used for the living, of course, and the appearance of the feet could be the result of polio or a birth defect. More research may or may not solve the mystery. Maureen Taylor, The Photo Detective, observed that the young woman was holding a letter in her hand. Maureen is at a decided disadvantage in not having the original photograph or a scan of the area of the hands. In looking at a blow-up of the hands I found shadows and pixelation, it didn't look like a letter to me. But, for the sake of argument, let's say there is a letter in her hand. Would that be so uncommon as to make this photograph one of a living person? Again, in an effort to make the deceased appear to be living, props such as toys, flowers, books, and newspapers were used when taking postmortem photographs. 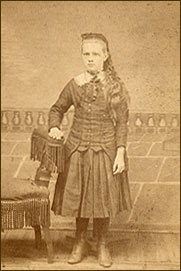 The following are examples: A postmortem photograph of a young woman sitting up with her eyes open, holding a book. Another, an image of a man sitting in a chair. A circa 1860 postmortem photograph of a deceased man in a chair with table and book. The body is arranged so as to appear lifelike, as is this postmortem photograph of a man sitting in a chair with a newspaper in his lap. The most disturbing of this group is the young woman whose photograph was taken nine days after her death. There has also been much discussion about the fact that the young woman appears to have been photographed in a professional studio. That can be surmised from the chair, the painted backdrop and the photographer's imprint. The question is whether or not photographers photographed the deceased in their studios. The following is an 1865 advertisement for just such a service by the photographers Southwork and Hawes. L.H. Crawley of The Virtual Dime Museum has also submitted an advertisement from the September 1847 Brooklyn Eagle for J.B. Leathers. We make miniatures of children and adults instantly . . . and of Deceased Persons either at our rooms or at private residences . . . We take great pains to have miniatures of Deceased persons agreeable and satisfactory, and they are often so natural as to seem, even to Artists, in a quiet sleep. So taking the deceased to a photographer's studio was done. In researching the photographer credited with taking the photograph in question, (Ph. W. Lenz, 1190 Iowa, Dubuque, Iowa) I found another Lenz in business in Dubuque, who made tombstones. Perhaps the business was kept in the family. Further research found that an 1878 Manual of Necroscopy suggested, "In a well-appointed mortuary provision should be made for photography." This apparently leaves the option open for the mortician to act as photographer, or the photographer to make use of the mortuary facilities. Our young woman could have been photographed in either place. The photographer remains a mystery. In 1895 and 1896 the Lenz Brothers were photographers in Dubuque, Iowa. Our photograph does not list the studio as Lenz Brothers, but rather as Ph. W. Lenz. It is unknown if the Ph. stands for a name or for Photographer. It has not been determined if this is one of the Lenz Brothers' photographs or one by an entirely different photographer. The Dubuque Library has not found the photographer. They are also researching morticians for the period 1880 - 1900. If they find any information I will post an update. A search of Ancestry, Heritage Quest, Sanborn Maps, and other genealogical sites have resulted in no information. Many of you questioned whether she could be blind. I am doing some research into women wearing glasses and I have this photograph to offer. 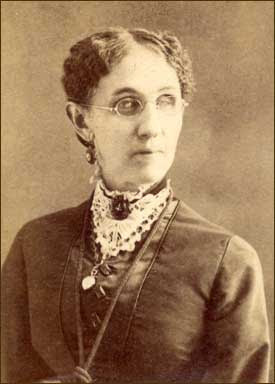 The blind often wore glasses with tinted or black lenses. It didn't make the blind more comfortable, only those looking at them. While it's possible our young woman is blind, I believe even a blind woman would have been uncomfortable with her dress tucked under her in such a manner and her legs at such an odd angle. The fact that she looks blind or sleeping is most probably a credit to the artistry of the photographer. Thank you all for your interest and comments. A special thank you to Maureen Taylor for her assistance. You have the benefit of my research, has it changed your mind? Is she dead or alive? One can no more look steadily at death than at the sun. If you are determined to look steadily at death and postmortem photography, I suggest the following sources. A Family Undertaking - Gone But Not Forgotten. POV, PBS. Burns, Stanley B. Sleeping Beauty: Memorial Photography in America. Twelve Trees Press, 1990. Burns, Stanley B. & Elizabeth A. Sleeping Beauty II: Grief, Bereavement in Memorial Photography American and European Traditions. Burns Archive Press, 2002. Newth, A.H. A Manual of Necroscopy. London: Smith, Elder, & Co., 1878. Ruby, Jay. Secure the Shadow: Death and Photography in America. Boston: MIT Press, 1995. Suspicious. Photograph (Card Mount). Unknown. Privately held by the footnoteMaven, [ADDRESS FOR PRIVATE USE,] Preston, Washington. 2008. Blind. Photograph (CDV). Unknown. Privately held by the footnoteMaven, [ADDRESS FOR PRIVATE USE,] Preston, Washington. 2008. I Still Think She's Dead, But . . .
Wow - what a revealing wealth of information! I am still processing this and had no idea as to the many types of post mortem photos. The one with the child and the parents and the medicines in the background reminds me of many Renaissance paintings or even Victorian "memento mori" type needlework where clues were often left in the foreground or background, many times symbolic, which explained how the person died. Good eye! Many early photographers imitated the styles of the Old Masters. I believe that the bottles were left in the photograph as a clue. Were I familiar with the medical practices of the time I might know what that clue is. It's funny how times change. I looked at those photos, but I don't think I could look at the photo of a loved one taken when deceased. My husband just popped into my office as I was reading this post. He asked what I was reading and when I told him what the post was about and who wrote it he walked out of the room shaking his head saying, "She must be a hoot at parties." I have a few postmortem photos in my meager collection, including one I took myself of my mother in her casket. The only picture I have of my paternal great grandmother is a postmortem one. It's not a photo I enjoy looking at but I treasure it for just the reason you mentioned... it's the only one I have of her. I find this whole subject absolutely bizarre, yet (even moreso!) absolutely fascinating! I showed the "I think she's dead" picture to my daughter, who has no interest whatsoever in genealogy or old photos, and her comment was also, "Maybe she's blind." Who knows? I love your blog! I am a huge fan of old photographs as well and I have so many of family members that I've scanned and have on CDs. I love the "mystery" of them as you said and love to give copies of them to family members for special occasions. I am anxious to make time to really read all your posts and can't wait to look at the Friday's digital scrapbooking segment. I am so glad I found you through iPentimento. Please tell your husband that this is the second time I've been called a "hoot" this week. At least he didn't say "old coot." After a little wine, I'm rather good at parties. And Jasia, I do know what you mean. Fascinating like a train wreck. You just have to look. I so know what you mean. I think we'd all like to think of her as blind. I'm so glad you found me. It takes one to know one, and I'm also glad you love Shades. My personal family history blog is footnoteMaven, and there are many family photographs there as well. MAVEN, You are a hoot. And this is absolutely wonderfully researched, written, and presented. I followed all your links --- each one of them --- I HAD TO LOOK. This is a subject I've never read about --- thanks for the education. Yes, I've changed my mind about your "I Think She is Dead" lady. She was. This is absolutely fascinating - I have been awaiting the update since last week! Some of the photos remind me of the ones taken of a lady called the "Brooklyn Enigma" (about whom I intend to write) who was an invalid for about 40 years (late 19th century). She was often photographed in bed in a sort of trance state. She was said to be psychic and had multiple-personality issues too. I own her biography, which has the photos. Brilliant deduction, Watson, er, I mean ShadyMaven. What an appropriate subject for a blog with the title "Shade of the Departed." Little do most people know just how popular post-mortem photography was in the past, because, as you mentioned, photography was a new genre and it compelled people to take advantage of it. I'm sure that many post-mortem photos went into the waste bin after being inherited by unsentimental (and spooked) family members. I am always amazed with your research skills, and I have to agree that the subject in question appears dead. If photographers could manage taking standing photographs of the deceased (really weird to see), they could certainly manage sitting them in a chair. I wonder if the medicines next to the grieving mother might be for her own use -- maybe smelling salts or something to soothe her emotions? Thank you for the wonderful research and helpful examples. I was just going through my files, and found this from the Brooklyn Daily Eagle, Sept. 8, 1847, p. 2 - ad for a J.B. Leathers, "Daguerreotype Artist" who takes "Likenesses of invalids, or deceased persons, taken at residences." - is it a commentary on the fact that even in the modern world and with advances with medicine, children die? - are the parents trying to communicate to the viewers that "we tried everything we could"? Wow! Well done ShadyMaven. Dead people standing? Who would have guessed? Morbidly fascinating. Thank you for the link...And apologies for not sending you a direct link to the Eagle ad - I was about to rush off somewhere and was trying to type the info off a notecard while being called urgently! I am truely fasinated at this subject! I have seen several casket photo's and always found it odd that people would want photo's of the dead but in doing genealogy I have learned the many reasons why this was done, I will admit not EVER have I heard of or seen (or to my knowledge realized) a dead person sitting or standing..... so I am going to dig thru all of the very old photo's I have copies of and see if I suspect this to be the case in the photo's. This has been a very interesting topic, which has propted me to have more work of my own....LOL! Wow,and I thought Van Der Zee (1886 - 1983) was a lone eccentric in this particular endeavor. I'm learning so much from 'Shades'! Does anyone own a copy of Sleeping Beauty: Memorial Photography in America? I would like any info on the photo of the child lying on a black cloth on a mirror. Thanks. Most of the links have...expired. As you see, her eyes are indeed painted onto her eyelids. I already knew about the braces and brackets they used for positioning, but wasn't aware that the bodies traveled PM to photog studios. Ah, well. Having a photog into the mortician's makes sense, but then so many people didn't necessarily use the services of one. What did that 9-day old PM photo look like? In the coffin - from a great distance? Surely nobody attempted to position that body in any naturalistic manner, unless it had been kept in an ice-house. I'll have to direct you to a photo I've wondered about for some time now - an extremely thin infant propped upright onto the very peak of a pile of bearskin. Her straight last shoes look odd all by themselves and add to the weirdness. This child appears to be alive, but it's the most frightening baby portrait I've ever seen! I create pencil portraits of deceased people sometimes. Quite a few of stillborn babies. I am able to draw them and leave out bruising, etc so people can remember their child. So I absolutely understand why people had the PM portraits done, and I don't think it's morbid at all. It's a path of grieving. I love these photos, the care taken, the sadness too... One thing that struck me was the horror expressed by readers, but post-mortem photos are still made these days. Especially for still-born babies, or babies who died very soon after their birth. The pictures look like regular baby pictures. To me it seems a very beautiful way to remember a loved one. Post-mortem photography is still a going concern - it is mostly offered through hospitals and grief centres for the parents of still-born infants, or the parents of children born terminally ill. The latter case often never get another chance to get a photo of their baby without the child being half-hidden by medical paraphenalia.